Offensive back: Stephen Morris, QB, Miami. Morris threw for a Miami and ACC record 566 yards to lead the Hurricanes to a 44-37 win over N.C. State. The junior quarterback completed 26 of 49 passes, and recorded five touchdowns, tying five other Miami quarterbacks for the most in a single game and the first since Kyle Wright at Wake Forest in 2005. His fifth touchdown pass of the day was the game-winner, a 62-yard pass to Phillip Dorsett with 19 seconds remaining. It was his second scoring throw of more than 60 yards on the day. Morris registered 271 passing yards in the first quarter, becoming the fourth FBS player to throw for that many in a quarter since 2004. In his last two games, he has thrown for 1,002 yards. Offensive lineman: Bryan Stork, OL, Florida State. Stork, the most experienced player on the Seminoles’ offensive front, posted his second consecutive outstanding performance of the season in the 30-17 win at South Florida. Stork graded out at 77 percent and had just one missed assignment while triggering all 67 snaps for the Florida State offense. He was not penalized and did not yield a sack in a performance that came on the heels of a career-best 95 percent grade against Clemson. The Seminoles rolled up 424 yards of total offense (242 pass, 182 rush) against the Bulls. 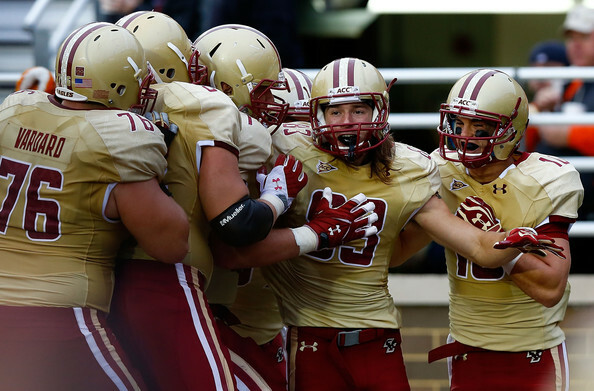 Reciever: Alex Amidon, WR, Boston College. Amidon caught eight passes for a career-high 193 yards and two touchdowns in Boston College’s 45-31 loss to Clemson, accounting for 52 percent of the team’s receiving yardage and 39 percent of its points. Additionally, the total marked the most receiving yards in a game for a Boston College player since Gerard Phelan had 226 receiving yards against Miami on Nov. 23, 1984. Saturday’s Boston College-Clemson game featured the top two single-game ACC receiving performances so far this fall; Amidon’s total was just 4 yards behind Clemson’s DeAndre Hopkins’ 197-yard effort. Amidon has eclipsed 100 receiving yards in three games this fall, and ranks fourth among all FBS players in receiving yards per game (139.8). Defensive Lineman: Cornellius Carradine, DE, Florida State. Carradine registered a team-high nine tackles, including 1.5 quarterback sacks and a forced fumble, as the Seminoles defeated South Florida. The Seminoles limited USF to 124 total yards after the first quarter en route to moving to 5-0 on the season. Carradine’s late third-quarter sack of USF backup quarterback Matt Floyd resulted in a fumble, which teammate Christian Jones scooped up and raced 12 yards into the end zone for the Seminoles’ final score of the game. Through five games, Carradine leads the Seminoles with 28 tackles and seven sacks, while his eight tackles for loss trails teammate Bjoern Werner by one. It is the second weekly honor of the season for Carradine. Linebacker: Gionni Paul, Miami. Paul, making his first start at middle linebacker, tallied a forced fumble and career- and team-high 11 tackles, including eight solo stops, in Miami’s 44-37 win over N.C. State. Paul’s 11 tackles match his total in his first 11 career games. Defensive back: Jordon Byas, S, Duke. Byas led Duke to a 34-27 road win over Wake Forest by recording a team-best and career-high 11 tackles. He also added one interception and half a sack -- both firsts of his career. Byas has helped Duke to a 4-1 start to the season, marking the best five-game opening to a season since the 1994 squad started 5-0 while matching the third-best five-game opening to a season since 1966 (5-0 in both 1988 and 1994; 4-1 in 1971, 1974 and 2012). Specialist: Dustin Hopkins, K, Florida State. Hopkins missed an early field goal from 48 yards but made his final three attempts in a 30-17 win at South Florida. By converting from 26, 43 and 23 yards, Hopkins pushed his career field goal total to 69, which ranks second in Florida State and fourth in ACC history. With 12 points on the day, Hopkins also moved into sole possession of second place on the Florida State and ACC career scoring charts, with 377 points. He trails Florida State record holder Derek Schmidt and ACC record holder Nick Novak of Maryland by 16 points -- they both finished with 393 -- to become the all-time leader. Hopkins is also just eight points shy of moving into 10th place on the NCAA all-time scoring list. Rookie: Eddie Johnson, LB, Miami. Johnson had seven tackles (six solo stops), one sack, two forced fumbles and one pass breakup in Miami’s 44-37 win over N.C. State. 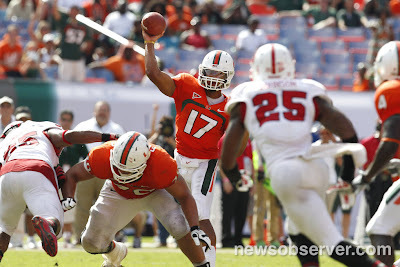 His six solo stops were second among Miami players and the seven tackles were third on the team.